Good morning frost-bitten Kentuckians, you can bundle up a little less today as a shift to southerly winds makes us warmer but showery before Saturday storms. After one last chilly morning, temperatures will advance to near 50 by the afternoon, and you will be able to set aside the winter wardrobe aside for a few days. Some light, nuisance-type showers are also possible throughout the day. The wet, but warming trend continues overnight and into tomorrow, so wearing the lighter weight rain gear tomorrow will be a good call. Scattered showers are likely, but temperatures will warm to the upper 50’s by the afternoon. The first day of December will bring us some heavy rain and claps of thunder. A low pressure system to our northwest will usher in the warm temperatures (mid 60’s), moisture, and wind shear needed for producing storms some of which might become severe. 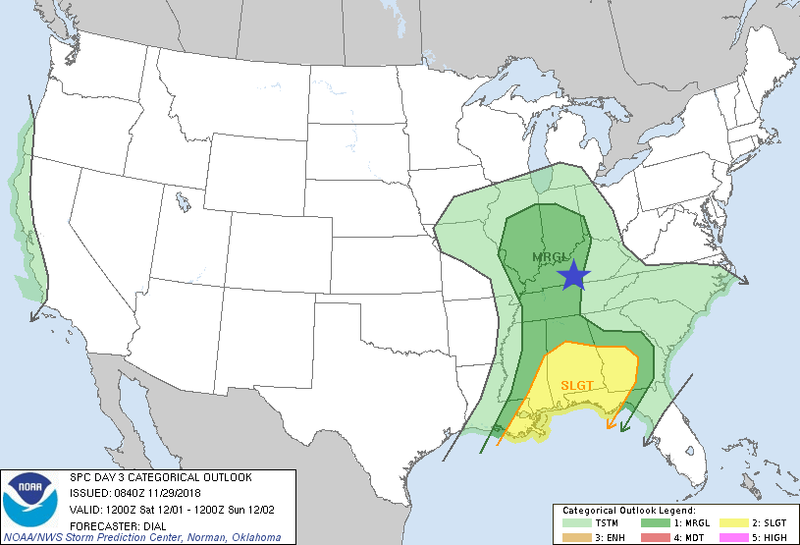 The Storm Prediction Center already giving us a marginal (1/5) risk of severe for Saturday. At three days out from this potential severe weather, we are still unsure about the exact timing and strength of the storms, but we will get a better picture as Saturday approaches. Sunshine at last returns for a beautiful Sunday with afternoon highs in the mid 60’s. This is definitely your reward for enduring a week of arctic cold, gloomy skies, and storms. Temperatures look to cool back down to average for the start of next week. That is all I have for today, so follow @wxornotbg for the latest updates on Saturday’s potential severe threat.